Pillaging is paying off for History’s ‘Vikings’. The cable network History Channel picked up the series for a 10-episode second season. ‘Vikings‘, History’s first scripted drama series, has drawn an audience, averaging 5 million viewers over its first five episodes. “Vikings is a win-win for us. As our first scripted series, Vikings has paid off in a big way with critical acclaim, strong ratings and a passionate, loyal fan base,” History executive vice president Dirk Hoogstra said in a statement accompanying the renewal announcement. 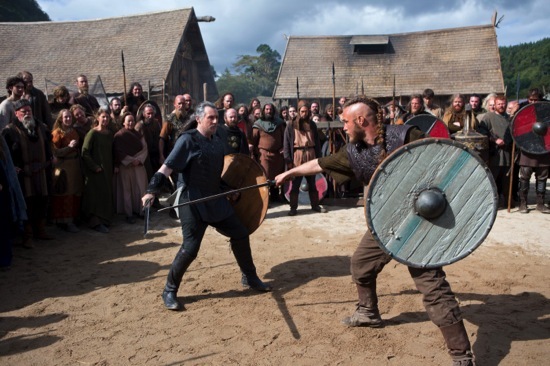 ‘Vikings’ stars Travis Fimmel and Gabriel Byrne. Stunt Coordinated by Franklin Henson and Richard Ryan and joined by Guild Members Alan Walsh, Aoife Byrne, Brendan Condren, Caroline Simonnet, Conor Hegarty, Darron Costello, Eimear O’Grady, Gerry Behan, Keith Ward, Marc Redmond, Michael Hanna, Norman Kelly, Paul Thompson, Peter Dillon, Phil Lonergan, Stav Dvorkin and Tony Condren. Three more ‘Vikings’ episodes are still to air until the April 28 season finale. Episode 7 is to air this Sunday which has the biggest scene in terms of stuntmen shot for the season.